It was like someone squirted lemon on my brain. -- My paraphrasing of Blue Balliett, describing a moment of literary inspiration. And now, a listy post! Lessons from a Dead Girl, by Jo Knowles, a sister alum of the Center for the Study of Children's Literature. I've been meaning to read this for ages, am halfway through, and am loving it.The True Confessions of Charlotte Doyle, by Avi. A bit embarrassed never to have read this one.A Hole in My Life, by Jack Gantos (memoir).Chasing Vermeer, by Blue Balliett (middle grade art heist mystery), with illustrations by Brett Helquist.Marcelo in the Real World, by Francisco X. Stork. The Simmons Summer Institute is this weekend; I speak Friday, which I'm very grateful for, because it means I'll be able to enjoy Saturday and Sunday events, rather than rattling around like a nervous wreck. The schedule is here. Graceling is the winner of the Mythopoeic Fantasy Award for Children's Literature! 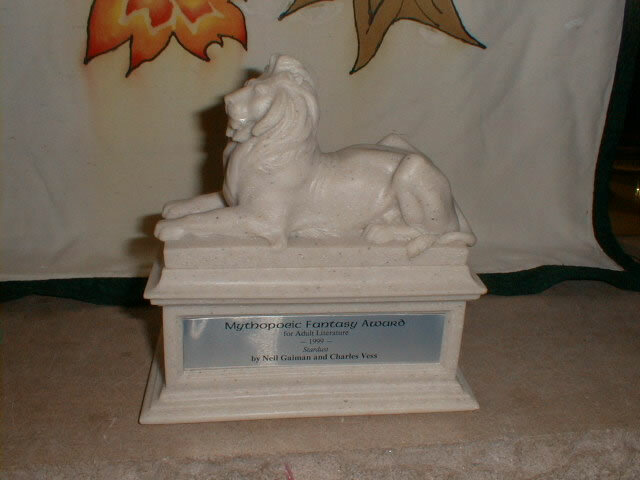 Here is the official announcement of all the 2009 Mythopoeic Awards. Here is more information about the Mythopoeic Society. Here is what the award looks like. (Except that mine won't have Neil Gaiman's name on it. ^_^) Isn't it cool? I'll post a link to my acceptance speech once the Society puts it up on their page. In the meantime... *sniff*... thank you SO MUCH to the Mythopoeic Society for this honor. I'm taking a moment away from the boxy madness to point out the profile Publishers Weekly did of Fire this week. The online version is here. The focus of the piece is something that's close to my heart -- the wonderful way that Houghton Mifflin Harcourt (Graceling's publisher) and Penguin (Fire's publisher) are working together to promote both books. The article explains why I've got two different publishers. I love both of my publishers, and I must say that I consider myself to be a very, very lucky author. And now, I return to the boxy pandemonium. I have furniture. I have the Internet. I have food in my fridge, sheets on my bed, and clothes -- well, I have clothes all over the place. I have the Rockies in the office, the Alps in the kitchen, the Andes in the bedroom, and the Himalayas in the living room (when it comes to piles of boxes and overflowing miscellaneous crap, I mean). I have my atlas for using as a reference whenever I need to list mountain ranges in order of increasing altitude. I have a vision for my new home. It is going to be fabulous. I have a sense of overwhelmedness at everything being so chaotic; at how much housework there is to do; at how hard it is to find things in these piles; at how my career responsibilities do not slow down just because I'm moving. Everybody, good news all around. And -- I need your help deciding what to toast with! Graceling is the winner of the SIBA Book Award in the Young Adult category! (SIBA is the Southern Independent Booksellers Alliance.) Oh my goodness, the indies have been so kind to me -- I can't even express my gratitude. Thanks so much to SIBA. And everybody, buy indie! In other good news, I am heading to MA tomorrow, and my stuff arrives soon after. I am so ready to be surrounded by boxes that are to be unpacked, rather than boxes that are to be packed. Hopefully calmness to come -- eventually, anyway -- now that the move is nearing its end. In the meantime -- I am the happy owner of some new wine glasses that I love madly... but I'm more of a beer drinker, and am only recently getting into wine. Can anyone out there recommend some nice wines for beginners? Red wines, please, because my new glasses are big fat balloon goblets, and I think those are for red wine? :D? I start every scene with a plan in mind, and occasionally the characters behave, and the plan in mind becomes the scene on paper. But more often, I discover something I didn't realize about one of the characters, or an interaction doesn't play out with the particular type of feeling I thought it would, and the scene starts to go off course, and I have to chase after it, and pages get written and then crossed out, and I can't figure out what needs to happen, and I begin to get Extremely Grumpy and mope around under a storm cloud. Happily, I'm at my parents' house right now, which means that a cat named Lickety comes by rather often to commiserate. Well, really, she comes by because she wants to make herself the center of my world and be petted forever. I was lying on the couch the other day in artistic despair when Lickety jumped up and threw herself against my hand, which only ever means one thing. But do you know the work of artist Maira Kalman? Her The Principles of Uncertainty is one of my favorite books ever. And she designs awesome umbrellas. AND occasionally her artwork shows up on the "Opinion" page of the New York Times online. Check out her latest -- and when you're done, scroll all the way down to the bottom of the page to see more offerings!